Jeff, the bison also comes in very small bags, and I'm pretty sure it comes in cans too. I'd wait for the nutritionist's expertise though. In the meantime, here's an excerpt highlighting how much selenium is in bison meat. Selenium is a tumor fighting mineral, and salmon contains selenium too. This excerpt also shows that bison is high in zinc and much lower in copper. "Bison meat is high in selenium, containing about 47 percent of the Daily Value per serving. Selenium functions as an antioxidant, helping to prevent free radical damage. Bison meat is a major source of zinc, containing about 25 percent of the Daily Value per serving. Zinc is used in wound healing, protein metabolism and the storage and release of insulin. Minerals present in a serving of bison meat to a lesser extent are potassium at 9 percent of the Daily Value, copper at 7 percent of the Daily Value, magnesium at 6 percent of the Daily Value, and calcium and manganese at levels insufficient to be of nutritional importance." I checked online and Petco had Sold Wolf King brand. The 15 lb bag was listed at $20.99. The 30 lb bag was $38.99. If ordered online, you would need to add shipping charges. They had a smaller bag size, too, but I don't remember how much. There's a Petco that I can go to and will check to see if they carry it in the store. After reading so many posts of Chows having cancer, I am very interested in making some diet changes even though I have been very happy with the Nutro products. Kiwani has been exceptional in providing information and I am anxious to hear what Pekoe's nutritionalist suggests. http://www.dog.com also carries this online but its alittle more $ plus you have to add shipping charges, too. I'm intersted in what the nutritionist says also. I've read on other forums grain free is the way to go with cancer dogs. I guess the carbs "feed" the cancer. That's what I've heard. Willow doesn't do well on grain free foods, though. So, I've got no personal experience with it. Jeff-I have returned more open bags of kibble, they will take it back. To the best of my understanding, I think this refers to refined carbs, like white flour, white rice, and not to complex carbs from whole grains, legumes, vegetables. Selenium works with vitamin E. Both are anti-oxidants and both are found in whole grains. The refined carbs have the vitamin E portions of the grain removed, so when you see "ground rice" on a label, it refers to white refined rice. Refined "foods" also make the body more acidic. An acidic state makes it harder for the body to release toxins, and toxic load allows disease to flourish. There is a healthful range of body pH, and I often use pH test strips to check the acid/alkaline range. Meds also make the body acidic, and dealing with toxic loads makes extra work for the liver too. I know you can return food to almost all the pet food stores but personally I don't like the policy, I would guess they refill the bag, reseal it then put it back on the shelves. I always triple check the bags I buy to make sure it has a factory seal on it, I may be overly paranoid but who knows what some sicko is returning and I don't want Pekoe eating food out of a bag that has been returned. I never return food if Pekoe dosn't eat it i just give it to a homeless person with a dog. Sence were talking about food, here's an update on that Diamond food. all of our dogs have ate old roy and dog bones by them too. The peanut butter ones and the beef ones. we have never had any problems and the vet has never said anything so I am guessing it's ok.
Mommy to Storme, Beatle, Bailey and Mufassa aka Moose. I started off feeding him with science plan but he wouldn't eat it, i tried all kinds of tinned food , not intrested or it gave him bad wind or the runs so i gave him boiled chicken. He has boiled chicken mixed with Bakers complete dry dog food or James Welbeloved dry food and brown rice, the chickens come from asda it was taken over by walmart so its basically the same. I get 2 medium sized chickens for £5 he goes through about 4 a week so its not too expensive and I know what he's eatring is good fresh food he also gets a small tin of tuna in brine and sometimes will eat a tin of sardines in oil if i tease him with them. On a Sunday he gets to have some Roast beef or Lamb he especially loves the leg bone with a little bit of meat left on it, but I take it away from him before he eats the bone itself as it makes him sick. He sometimes has sausages as well if hes been a good boy down at the park. As you can tell he's a spoilt dog but worth every penny. I've found that I prefer to feed my chows home cooked food; I make a stew with meat, (ground beef or ground turkey of a combo of both) celery, carrots, peas, lima beans, spinach, green beans any combo of them, up to a cup per pound of meat. with garlic added. I mix this with slightly over cooked rice, (brown or white) The portion for Darkwind is 3cups rice 2 cups stew, for Firesong it's 2 cups of each. (she needs the extra calories, he doesn't). I add vitamin and minerals and essential oil suppliments every other day. However cooking this is time consuming, (I work full time and now go to university half time), AND in the summer I never can figure out how much they are going to eat and end up throwing away about half of what they are served, (and if I give them half of what they normally eat, they inhale it and start looking for more). So I went looking for a highquality natrual food that was like what I made them, I found California Natural, lamb and rice, chicken and rice or Nutro-Gold Natural. These are dry foods, and they love them and most importantly they don't get 'high' in the bowl and they can eat what they want and I don't end up throwing portions away. Yes it does cost a bit more, but I figure I save on Vet bills so it comes out even. Also the dry food is better for their teeth which is a plus for these two. Darkwind and Firesong aren't picky eaters and don't seem to have any food allergies, (although rawhides are OUT!) But Ming was picky and only liked Purina. LiChi and MingToy ate the stew and rice and were fine with it. I look for foods that are low in corn, high in meat protein, have few or no preservatives, color agents and other fillers. I also monitor my chows to see how they do with their food. Bright alert eyes, shiny coats, no food aggression, small stools. good muscle tone, lots of energy and no allergy symptoms. I am suprised to see that no one is using Natural Balance. I LOVE this food and have had EXCELLENT results. Chi-Ching is on a mixture on Natural Balance Ultra Premium and Natural Balance Duck and Potatoe Formula. Koda is on the Duck and Potatoe Formula too. Koda is on the D and P because it is an allergy formula and has completely taken away his ear infections. Chingers will move specifically to the D and P also but we are weaning him on to it. Natural Balance is a life cycle food. Which means that it is good for all ages. It is a very good food. You can buy it at any Petco (or Petco.com) and I think that Natural Balance has a site of their own too. On the Petco site, I know that you can read all the different ingredients of each formula. They have quite a few to choose from too. I reccomend this food to everyone and I know that I will continue to use this as long as they make it. I have used it with my big dogs, my small dogs, my puppies and my adult dogs. Every one of them has done excellent. We are currently feeding Natural Balance Venison and Brown Rice! So far so good - the rottie is allergic to the planet so we change food alot. Have you tried the Potatoe and Duck? I was told that it is great for food allergies. Koda would just get ear infections that I couldn't seem to get better. After he was on this, they have been VERY clear. I haven't tried the Venison and Brown Rice. I will have to look into that too. We switch foods alot but it is all within Natural Balance. Koda was on the Reduced Calorie formula but I think that there was something there messing with his ears, He seems to be doing good now though. I even have all four of my cats on the Natural Balance Ultra Premium for cats formula. One thing I don't like about Natural Balance is that they add salt, plus they add salt and sugar to one of the treats I looked at. I don't think that would be the best choice for older dogs. Victory, I clicked onto this subject to tell about your way of cooking. We call it "Victory's Dinner" in our house and since you told me about it a long time ago, I have cooked it for Milly and Mabel. I have made a slight modification. I cook enough for two days - the first day they have it with their small bite mixer - I think you might call it kibble and the second day they have it with rice as you suggest. Then I cook another lot. Then after four days, I give them a change - maybe scrambled egg with mixer then back to Victory's dinner - then maybe tuna and rice and so on. They love it and sniff it when I am cooking it. As you say, it is a bit more expensive but I considere it worth it. And it smells so good and looks so healthy. Mine eat purina one lamb and rice mostly. Once in awhile purina one chicken and rice. They go through a 20lb bag about every 6 days. If I get the 37.5lb bag I get about 2 weeks out of it. They all love veggies! Carrots and broccoli. OJ goes crazy for cold lettuce from the fridge! You'd think it was a steak the way he reacts! He also chases my wife around for peppermint lifesavers! Not sure what that's all about but figure one or 2 won't hurt. His kids don't care for them except for Xena she tried one but didn't finish it and never looked for any more. Each get a bowl of dry food every morning and all the water they want. Funny thing about the water, they won't drink it unless its chilled in the fridge. I feed my chows Innova Adult Dog Food. Its very natural and has lots of Omega 3 & 6. Its good for sensitive skin! Koda was weaned on Purina One Lamb and Rice for Puppies, which is what I fed for awhile also, now I have him switched over to the Purina One Chicken and Rice for large breed puppies... and since I did that, he went through a major growth spurt. My vet didn't want me to start him on the more expensive premium foods unless we started having problems with allergies. As far as Old Roy goes.... that's what Sasha ate when she was alive and loved it. But... I didn't know much about chows and allergies back then either. The vet said no Old Roy. He said altho Old Roy has come a long way in 10 years and he doesn't see near as many problems as he used to in dogs that are fed it, they still have a lot of improving to go and he said feeding it to Koda would be pushing it. He recommended Purina One unless he starts having allergy problems. kiwani wrote: One thing I don't like about Natural Balance is that they add salt, plus they add salt and sugar to one of the treats I looked at. I don't think that would be the best choice for older dogs. I think that is the reason I rejected it when I was looking, I remember my vet committing specifically when I told him about the stew, NOT to add salt ever, the meat protein they get contains enough salt for them, (us to actually). And sugar is a no no for all dogs and cats as far as I'm concerned which is why I stay away from corn, (too high a sugar content) Which I believe may be leading to an increase in diabetes among pets, cats in particular. ngraham wrote: Koda was weaned on Purina One Lamb and Rice for Puppies, which is what I fed for awhile also, now I have him switched over to the Purina One Chicken and Rice for large breed puppies... and since I did that, he went through a major growth spurt. My vet didn't want me to start him on the more expensive premium foods unless we started having problems with allergies. As far as Old Roy goes.... that's what Sasha ate when she was alive and loved it. But... I didn't know much about chows and allergies back then either. The vet said no Old Roy. He said altho Old Roy has come a long way in 10 years and he doesn't see near as many problems as he used to in dogs that are fed it, they still have a lot of improving to go and he said feeding it to Koda would be pushing it. He recommended Purina One unless he starts having allergy problems. What do Kiwani and Chowlover think? My perspective is that 'medium' size as a breed referred mostly to withers height, and the earlier Chows were lighter weight, finer boned. Chows are now considered to be heavy boned, broad skulled, well muscled, more densely coated, and they do have melanin mouths which require a good network of blood vessels for optimal pigment. 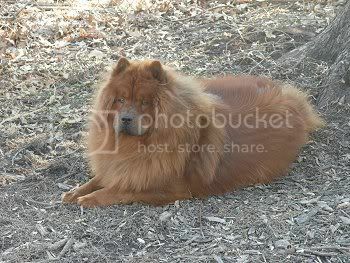 Chows generally weigh more now than they did a few decades ago, 65 pounds or more is not so unusual for a male. It's my understanding that large size refers to a category of 55 to 85 pounds or so. Then there's extra large or giant. This particular Koda was considered by his vet to be a *big* boy, maybe reaching close to 70 pounds. The growth spurt didn't seem too unusual to me, and I think the vet would have said something about it since his weight is charted with every booster visit. A dense and double coat *alone* takes a lot of hormone power to maintain, and then there's all the rest. Leo is a very picky puppy. I have fed Canidae, Kirkland brand chicken & rice, Chicken soup for the puppy lovers soul, Wellness, Solid Gold Wolf King and currently Inova Large breed puppy. He hates them all! So, I feed him whatever Kibble we have and then raw chicken, fish or beef OR a can of Merrick wet food. He loves raw, but I am afraid of not balancing it correctly. I am going to try Timberwolf Organics food next. It was recommended to me by someone that knows a lot about chows & nutrition. I am crossing my fingers that Leo will eat the Timberwolf, if not, I will try Royal Canin. I am running out of options! By the way, plain yogurt can also help with digestion problems such as gas & diarea. kiwani wrote: My perspective is that 'medium' size as a breed referred mostly to withers height, and the earlier Chows were lighter weight, finer boned. Chows are now considered to be heavy boned, broad skulled, well muscled, more densely coated, and they do have melanin mouths which require a good network of blood vessels for optimal pigment. 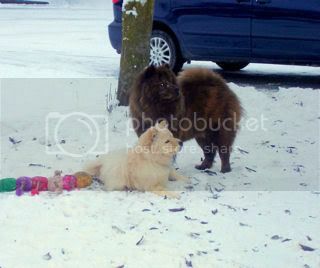 Chows generally weigh more now than they did a few decades ago, 65 pounds or more is not so unusual for a male. hormone power to maintain, and then there's all the rest..
Have a 4-month old cinnamon chowchow named Princess. We started with Eukanuba Lamb & Rice but my wife commented that her breath and pooh-pooh smelled bad so we shifted to Vitality Lamb & Beef. We were concerned with her hair-shedding and now it's Science Diet Lamb & Beef mixed with hard-boiled egg (half slice). Is this okay...the hard-boiled egg I mean? And could the change of diet be the cause of her hair-shedding? Incidentally I'm from Manila the Philippines where the temperature here averages 30 degrees Celsius (90 F). Hi JoJo and welcome ") My Koda is just now 5 months old and he is also shedding hair. I asked about it here a couple of weeks or so ago, and everyone had some great advice and reasoning on what was going on with this shedding. So you might want to go back on posts 2 or 3 weeks and check it out. Again, welcome to the boards.